The popular KJV Gift& Award Bible has been revised and redesigned with a new typesetting to offer the ultimate in readability and usefulness, making this the ideal gift for presentations and special achievements. 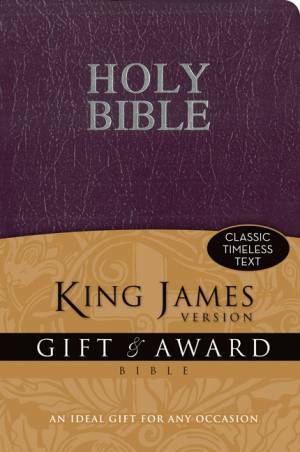 KJV King James Version Gift & Award Bible Purple Imitation Leather by Zondervan Publishing was published by Zondervan in February 2011 and is our 18614th best seller. The ISBN for KJV King James Version Gift & Award Bible Purple Imitation Leather is 9780310949145. Be the first to review KJV King James Version Gift & Award Bible Purple Imitation Leather! Got a question? No problem! Just click here to ask us about KJV King James Version Gift & Award Bible Purple Imitation Leather.